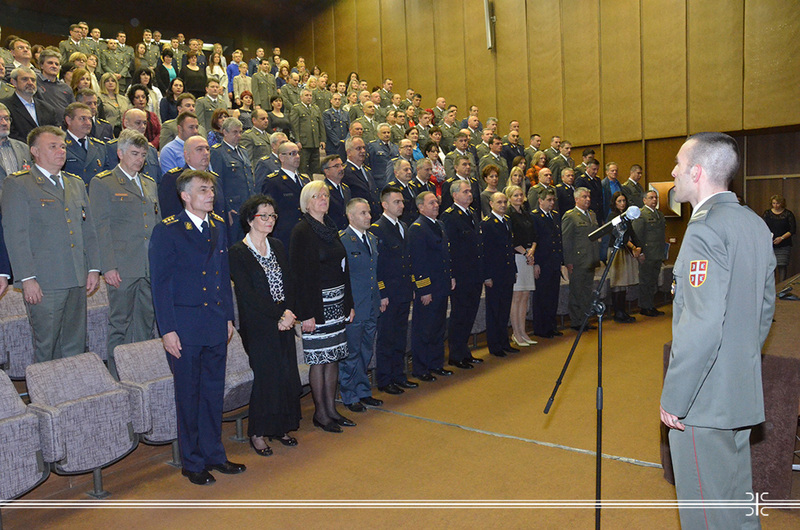 The ceremony on the occasion of 23 April, the day of the Serbian Armed Forces was held today at the Military Medical Academy. Addressing the audience, the MMA’s Deputy Head Col. Prof. Dr. Dragan Dincic said the MMA is privileged representing an inalienable part of the Serbian Armed Forces and the Ministry of Defence of the Republic of Serbia. He congratulated the awarded and promoted to higher ranks on the occasion of the holiday and noted that, although honestly deserved, the awareness of good work done is always more important that the award. He reminded of the long history of the Serbian Armed Forces and the decision on the start of the Second Serbian Uprising, which was the foundation for the creation of the modern Serbian state and respectable Serbian Armed Forces. He said that the tradition of such military is continued by the Serbian Armed Forces which today represents the backbone of the defence system of our country and the protection of citizens. By participating in peacekeeping missions, the military medical teams of the Medical Corps represent an important part providing health care, treatment and life saving all around the world, and with the engagement of its Armed Forces, Serbia raises the country's reputation in the international community. MMA Deputy Head stressed that the MMA would, as it has always been the case during the long history of existence, successfully overcome the current problems and continue to take care about the health of active member staff of our Armed Forces, the military and civilian insured people who need help.